Water from deep wells is often hard due to the presence of calcium and magnesium. It may also contain iron and sulphur. Water softeners, containing a mineral called zeolite, exchange the calcium and magnesium for sodium. Sodium is replaced by adding salt to the brine tank. The soft water is usually supplied to the water heater only. The waste water is discharged into the sanitary sewer. Hard water contains large amounts of calcium and magnesium. While suitable for drinking and gardening, hard water can cause mineral build-up in water heaters, pipes, dishwashers and showerheads, reducing its flow. Soap and shampoos ability to lather is reduced, and laundry becomes stiffer and duller in appearance. Generally speaking, groundwater is hard. - A water softener reduces water hardness, making it easier to shower and clean fabrics and dishes. With softened water, less soap is needed for bathing and laundry. Skin feels cleaner and clothing softer. Pipes, fixtures and appliances have less scale build-up. - There are four basic types of water softeners. You should discuss with your supplier which type would be best for your needs. 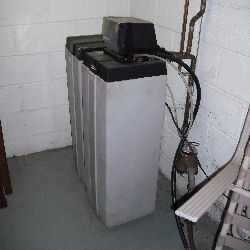 - Most water softeners will last for a long time with little maintenance. - A water softener does not remove harmful contaminants that could cause illness. Only water that is considered to be microbiologically safe should be used by the water softener. - A separate cold water line should be installed for kitchen use which bypasses the water softener. - There is no evidence that the water softener system has a negative impact on your septic tank and septic bed.